In looking at the most recent as well as the most horrific terrorist attack in the USA since 9/11, at a gay club in Orlando, there is no doubt whatsoever that it was Islamic-based, Sharia law, which requires the death penalty for homosexuality, that was the ideological and/or motivating jihadi-warfare factor that sadly left 49 people dead and 53 people wounded. I totally agree with former US Ambassador John Bolton that the attacker, Omar Mateen, is not a "one off" or a victim of so-called "mental illness". I completely agree with him that the root cause is unmistakably "ideological". I would also agree with other, high-ranking US officials, that Orlando is not an isolated "act of terror and hate" but clearly an "act of war". A single "act of terror and hate" is something committed by a mentally unstable individual or "lone wolf" acting alone. Whereas a single "act of war" is where an individual acts "ideologically", whether directly or indirectly, in concert with (hundreds or thousands) of others, as with ISIS. Though there may be elements of terror and hatred involved, it is not the principle, motivating factor. The principle, motivating caus, in Orlando was clearly ideological and/or a shared, Islamic-warfare driven ideology. There are many Muslim countries (e.g. Saudi Arabia) that have homosexuality as a capital crime. And likewise ISIS has both called for, as well as enacted, the same death penalty for homosexuality as a capital offence. Moreover, I believe it is critically important to describe the "kind" or "type" of terrorism that we are specifically dealing with and not just terrorism in general. To remove the Orlando attack from its Islamic context and to place it into another context (such as mental illness [instead of evil] or gun control or broad terrorism in general) is not only to engage in a faulty straw-man argument but also it indicates a serious failure or inability to face the real problem at hand, Islamic terrorism. And for a society to do so, is to continue to tragically live within an atmosphere of wilful denial — which is, most likely, for the sake of being (dangerously) politically correct and/or for not wanting to offend law abiding Muslims. This is a serious problem. Or rather, a serious and widespread socio-political pathology. According to "Muslim Statistics" and other statistical-based Muslim websites which gather information globally from various news and governmental sources, there have been over 28,000 "Islamic terrorism" attacks since 9/11 world-wide. And yet, many individuals especially on the left continue to wilfully ignore these realities, thus adding insult to injury. Though not all Muslims (world-wide) are terrorists, virtually all terrorists (world-wide) are Muslim. It is extremely important to maintain that critical balance without emphasizing the one to the exclusion of the other. Ultimately, or rather essentially, "Islamic terrorism" is not an international (or a Western) problem per se, but rather a unique problem that specifically belongs to the Muslim world — and has for some time. Unfortunately, because of progressive liberalism's radical, world-wide, ideological vision and drive for a globalist society, based on secular-humanistic principles of diversity, tolerance, openness, inclusion, religious pluralism, multiculturalism, cultural relativism, liberal equality, liberal rights, this "Islamic" problem has now become our problem in the West. And it is a problem that can be ultimately traced back to a serious weakness or blind spot within Enlightenment-based liberalism itself, the exaltation of human "reason" over divine "revelation" within Western thought and culture. Liberal Democracy, Multiculturalism and the Spirit of "Babylon"
I think that a very important or rather very hard lesson that seriously needs to be learned in the West from the Orlando terrorist attack and others like it, especially by professing Christians, is that the worshippers of liberal democracy's Enlightenment principles of "Liberty, Equality and Fraternity" (which replaced "God, King and Bishop") do indeed have serious weak points or inherent trajectories which, in turn, have opened the door to a self-destructive cultural Marxism and globalism that is rooted and grounded in an idolatrous, universal religion of Man or universal cult of Self, an idolatrous and self-destructive multicultural ideology where all cultures and religions, including Witchcraft and Satanism, are perceived to be equally good and/or intrinsically valuable in themselves. Thus, from a Christian perspective at least, a state-sponsored as well as state-enforced multiculturalism is nothing less than a modern revival of a purely paganistic and pluralistic spirit of "Babylon", with all her whoredoms on the rise once again. And so, as much as it is deceptively bewitching to those (blind leading the blind) who envision an ideal-global society, where Western liberal democracy and universal, human rights are lovingly embraced as being both natural and reasonable to all human beings, not to mention being the divinely ordained "End of History", it is not the true (or eschatological) reality for Christians. And for the West to continue to adamantly and uncritically pursue such idolatrous and self-destructive ideologies — i.e. ideologies that eventually arose out of the so-called "unfettered" humanistic and/or rationalistic principles and traditions of 18th century, Enlightenment liberalism's deification of human "reason" — will only lead to increased civil strife and unrest, more mass killings, the eventual breakdown of society and even civil war. 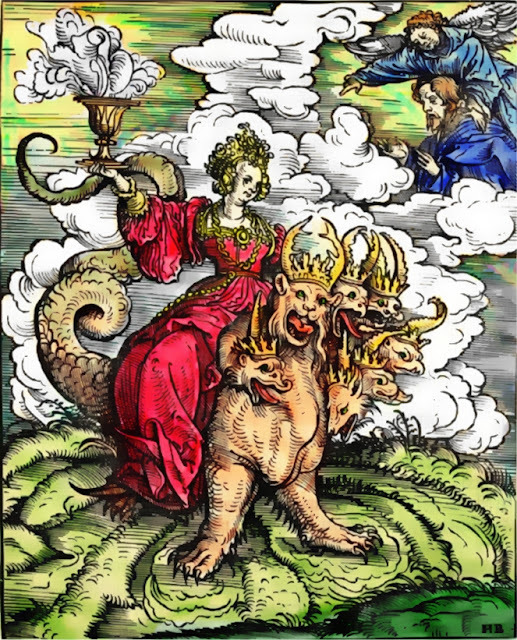 Reason is the Devil's greatest whore; by nature and manner of being she is a noxious whore; she is a prostitute, the Devil's appointed whore; a whore eaten by scab and leprosy who ought to be trodden under foot and destroyed, she and her wisdom...Throw dung in her face to make her ugly. She is and she ought to be drowned in baptism...She would deserve, the wretch, to be banished to the filthiest place in the house, to the closets (Martin Luther, Works, Erlangen Edition v. 16, pp. 142-148). Reason is the greatest enemy that faith has; it never comes to the aid of spiritual things, but — more frequently than not — struggles against the divine Word, treating with contempt all that emanates from God (Martin Luther, Table Talks in 1569).